The skirt has been designed to be an easy wearing skirt that will look great as day or evening wear. It should be made from soft flowing fabrics for a lightweight and elegant look. 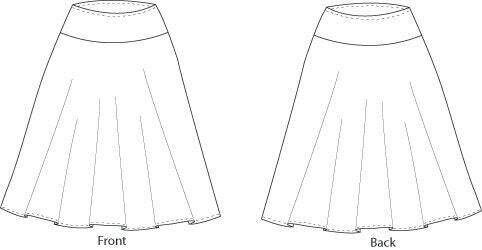 The skirt has a finished length of 24.5inches / 62cm, which for most women should mean the skirt length finishes just below the knee, although you may wish to lengthen or shorten the pattern to get your preferred length. The skirt features a faced yoke waistline, which is very flattering, and fastens at the side with a concealed zip (although you can use any fastening of your choice).